The TS-500 Hand Wrapping Machine allows hygienic product presentation and keeps products dust-free. 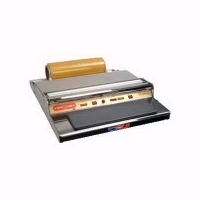 Ideal for wrapping meat, cheese and other items, the TS-500 is practical, portable and easy to use. H/W/D: 4.3" x 20.5" x 25.6"